VATICAN CITY (CNS) — An interfaith meeting in Assisi, a new book on Jesus of Nazareth and a website-launching tap on an iPad were among the highlights of 2011 for Pope Benedict XVI. Although the year saw a further cutback in individual papal audiences, the 84-year-old Pope still enjoyed a productive and busy 12 months, meeting privately with nearly 400 Church or civil leaders, addressing more than 180 groups and presiding over about 40 public liturgies. He traveled to Croatia, Spain, Germany and Benin, delivering 60 speeches on the road. In weekly talks at the Vatican, attended by nearly half a million people, he gave a series of reflections on the great teachers of the church and on prayer — a continuation of the “back to basics” approach that has marked his pontificate. The reduction of papal meetings and the introduction of a rolling platform for his entrance into St. Peter’s Basilica fueled speculation about the pope’s health. Close observers say that, like most octogenarians, the pontiff tires more easily today, but that he suffers no serious health problems. The year 2011 saw two of Pope Benedict’s favorite themes come into clearer focus: new evangelization and religious liberty. Increasingly, he has linked the two topics, telling bishops that both tasks require courageous truth-telling in sometimes hostile environments. 1. In October, the Pope hosted an interreligious meeting in Assisi, Italy, but added his own unique twist: He invited four prominent nonbelievers, and gave one of them the speaker’s platform at the event. It underlined his conviction that new evangelization must reach beyond the church’s traditional borders. 2. In August, when a rainstorm threatened to cut short a World Youth Day vigil in Madrid, the Pope could have bailed but chose to remain. After the rain stopped, a drenched crowd of 1.4 million fell to their knees in adoration of the Eucharist — a sight that must have impressed him deeply. 3. In May, he beatified Pope John Paul II at a Mass attended by 1 million people — the biggest crowd at the Vatican since the late pope’s funeral in 2005. 4. Publishing his second volume of “Jesus of Nazareth” in March, the Pope gave readers his version of “The Passion of the Christ.” The book presents Jesus not as a political revolutionary or mere moralist, but as the son of God who inaugurated a new path of salvation based on the power of love. 5. In October, meeting with experts on new evangelization, the Pope announced that he was convening a special “Year of Faith” in 2012-13 to help the Church renew its missionary energy. The initiative underscored the Pope’s belief that Catholics need to better know their own faith in order to share it. 6. In the first of a series of talks to U.S. bishops on their “ad limina” visits to the Vatican, the Pope said in late November that responding to the challenges of a secularized culture will first require the “re-evangelization” of the Church’s own members. He also encouraged the bishops to speak out “humbly yet insistently in defense of moral truth” on issues like marriage — an issue that will no doubt keep surfacing during the upcoming election year. 7. The Pope’s September trip to his native Germany was highlighted by his speech to the Bundestag, the national parliament, in which he strongly defended Christianity as a protector and promoter of social justice. But even more remarkable were his blunt remarks to German lay Catholics. He told them the Church in Germany was “superbly organized” but lacking in spirit; new evangelization, he said, will rely less on big Church structures, and more on efforts by small Catholic communities and individuals to share their faith experiences. 8. 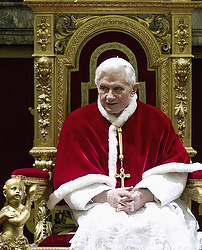 In a speech in May on Church social teaching, Pope Benedict strongly critiqued the global imbalances between rich and poor, and zeroed in on the international financial system, which he said had “returned to the frenzied practice of drawing up credit contracts that often allow unlimited speculation.” Throughout the year, he consistently challenged the consumerist underpinnings of modern economies, and the devastating consequences for the environment. 9. In Croatia in June, the Pope led a vigil for 50,000 young people in a main Zagreb square that was remarkable for one thing: the near-absolute silence in a long moment of prayer. Pope Benedict has insisted that a silence is important for spiritual reflection, and he has even made silence the theme of his message for World Communication Day 2012.